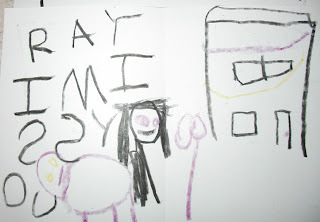 When we got home from our "walk", I collected the mail and saw that there was a package for Ray from his cousin, Hannah. Yuko had told me that when she and Hannah went to the dollar store, Hannah wanted to buy Ray a present so Yuko gave her a dollar (or two) to get Ray something. I opened the package to find two hand-drawn cards and two rope toys. 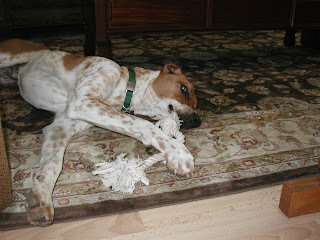 Ray loved his rope toys and the cards. 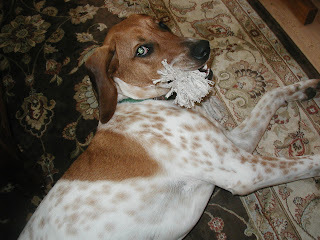 He sat quietly in the living room chewing on his rope while I tried to digest all that I had learned that day. I was feeling a bit overwhelmed. I tried to remember everything Lee had said. It was a good thing he had left reading materials, but I wished I had taken notes or a video or something. I wanted to do right by Ray, not confuse him or make him anxious. At least I knew he was a smart dog. I was pretty sure we could get through this. Well, actually there was no choice. We had to get through this. Gregg came home and I downloaded as much as I could remember onto his brain which tends to retain a lot more than mine does. He practiced the controlling noise; it's like a throaty "Bah" - like something Scrooge would make when he's pissed off. Ray seemed to be responding well to the noise. I took him outside and practiced Sit and Stay. I could tell that he didn't really 'get' Sit. He just couldn't figure out why anyone would want to sit when they could lounge or run around. It just didn't make sense. I started to think I should teach him "Play Dead," he seemed such a natural. 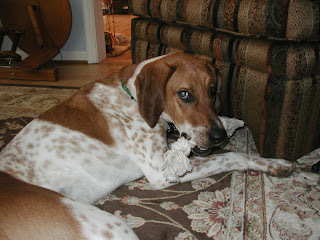 That night, I brought Moonie down and put her on her pillow on the couch next to Gregg. Ray was snoring at my feet on my side of couch. We made a fuss over Moonie and she seemed not to notice Ray (cats are good at pretending). I went up to get Hugo, and by the time I got back downstairs, Moonie was gone. Hugo didn't hang around at all, but immediately took off for Cat Siberia. I felt somewhat better that I was able to carry them downstairs without too much struggle, but still felt bad that they wouldn't stay with us anymore.